If you are looking for a way to protect and keep your images private in your smartphone, there is one. We present to you noScroll, a newly developed app by Munro Grant and released on the iOS platform. The app is designed for both iPhone and iPad, has clean and smooth user interface and it is one of the most cost-effective apps you can find these days on the market. The noScroll app is simple to handle and offers a pack of great features. As soon as you download and install it on your device you can start securing some of your photos that you don’t want to be seen by anyone. 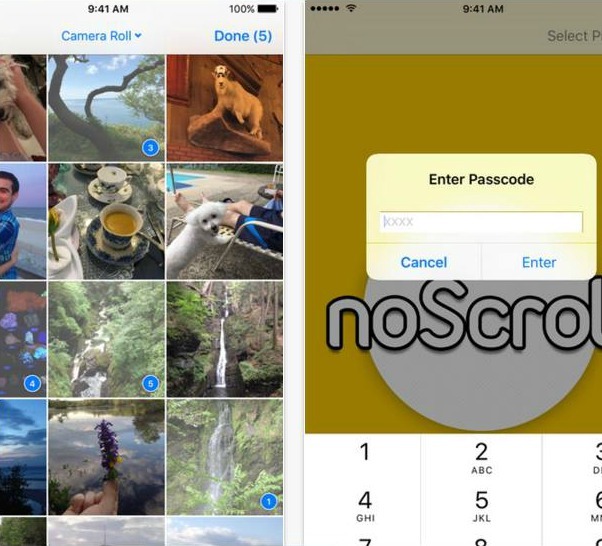 This no swipe photo app lets you pick one or several photos from your gallery and show them to your friends and family, while keeping the ones you didn’t select private and secure. It requires of you to set up your own password or TouchID. That way only you will have access to your photo gallery. Forget about swiping through your photos in order to find a particular one, download the noScroll app for only $1.99 from the App Store and enjoy what we’ve all been waiting for!